Okay, I'm getting the hang of this now! Practice makes perfect they say. This time, I'm sharing a sympathy card I made for a co-worker last fall. 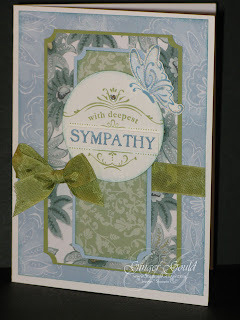 A sad occasion, but a pretty card to express my condolences and support. The stamp set used here was Thanks for Caring. I've used 3 different patterns from the Paisley Petals Designer Series Paper (DSP)...I LOVE that paper! So sad it is now retired, but I'm hoarding what I have left of it, LOL! The coordinating card stock used includes Whisper White, Baja Breeze and Pear Pizzazz. After stamping the butterfly image, I used the 2-Way Glue Pen to outline the image and sprinked on Dazzling Diamonds glitter. There is also a small Rhinestone Basic Jewel on the focal sentiment (see it there on the top?). I've used the Ticket Corner punch again on the layers, and the final touch is the Pear Pizzazz Seam Binding Ribbon. This card is much prettier in person. The photo really flattens it and merges the different patterns and images. Anyway, I hope it brought some comfort to my friend.